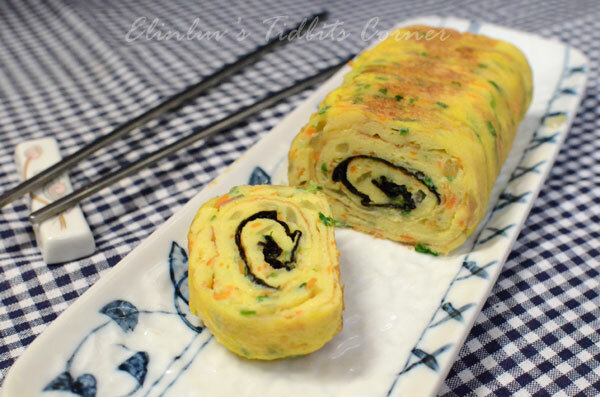 Korean egg rolls also known as Gyeran Mari in the korean language, is a great side dish and a popular lunch box menu and snack. It is my all time favourite side dish . The rolled up presentation of this egg dish makes it attractive and interesting not only to the adults but to the children too. 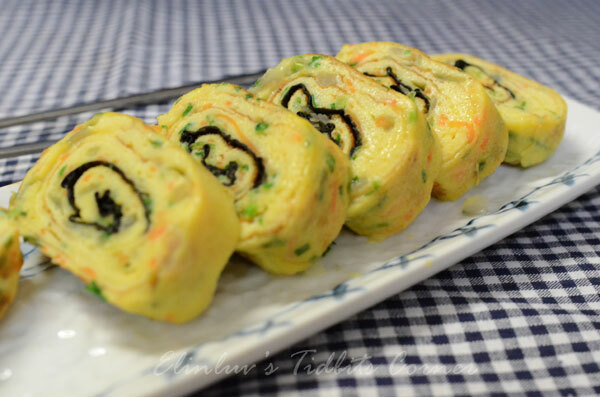 There are many variations, you can make simple ones with just spring onions and carrots or you can add nori seaweed , ham or even cheese to it. For me, I love this version whereby my ingredients are just diced spring onions, diced carrots , diced red onions and nori seaweed. 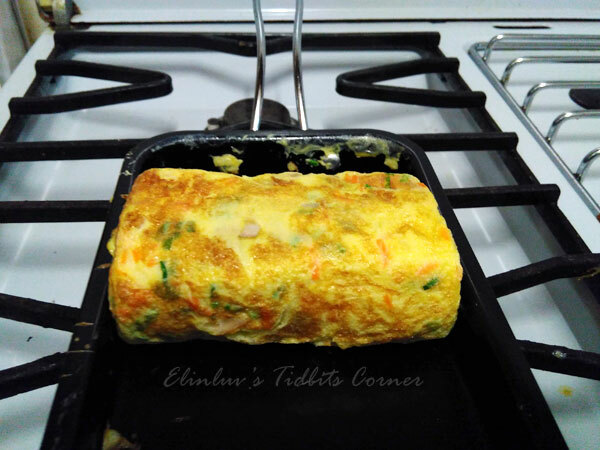 It is easy to make and the texture of this egg roll is soft and smooth and packed with flavors. 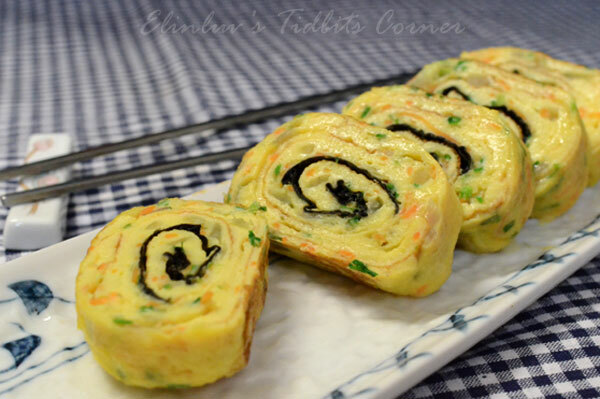 The Japanese soy sauce will be a great dip for this colorful and flavorful egg roll. 1. Beat up the eggs in a bowl and sieve it. Add in ingredients (A) to the sieved egg . Give it a quick stir to make sure the ingredients are all well combined. 2. Heat a non-stick rectangular pan or round skillet over medium high heat; add oil and swipe with a paper towel to apply oil as thin as possible. 3. 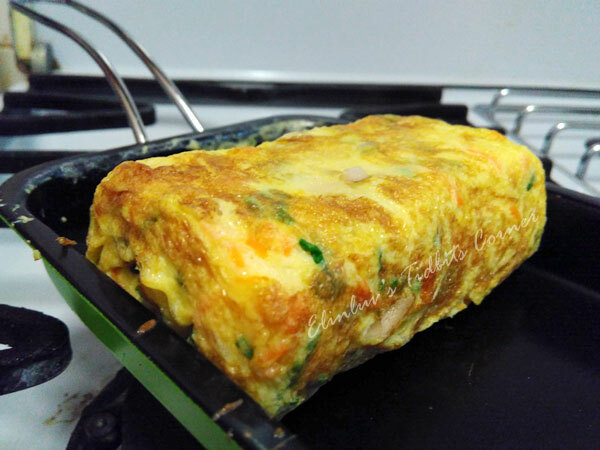 When pan is hot, pour a ladleful of egg mixture to cover the whole pan, once the egg mixture has lightly set, place the nori sheet on surface and gently fold over and as you keep folding, shape into square, once you finish rolling, push to one end of pan, add 3/4 ladle of egg mixture to cover the pan and reduce heat . 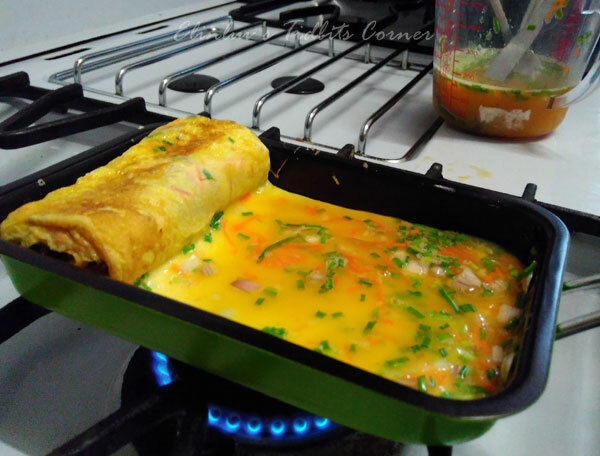 Make sure uncooked egg mixture’s attached to the first batch of egg roll. 4. Repeat twice more with rest of uncooked egg mixture. 5.. Remove from heat and let Gyeran Mari rest in skillet about 1 to 2 minutes. 6. Slice Gyeran Mari into 3/4” wide bite size pieces and serve . Oh, Elin, you make everything look so delicious. A big thumbs up to you!